Anticoagulant medications are very strong. Here are some general guidelines for taking your anticoagulant medication safely. You may take some anticoagulants in a tablet or capsule form, while others need to be injected. Whatever type of medication you have been prescribed, make sure you take it exactly as directed by your healthcare provider. That includes taking your medication at the same time each day. 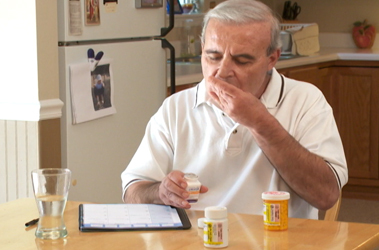 To help you remember when to take your medications, develop a system to help you keep track of them. Some people find a pill organizer helpful. It separates your medication by days of the week and times during the day. Some people use a checklist or calendar and cross off the medication as it's taken. And others post little reminders around the house so they don't forget. You could also use your phone's alert to remind you when to take your medication. If you miss a dose or are very late, contact your healthcare provider for instructions. Don't double dose to catch up. If you can't take your medication for any reason for a day or more, contact your healthcare provider. Store your medication at room temperature out of direct sun light. Do not take any new medications, herbs, vitamins, nutrition supplements, or over-the-counter pain relievers without first talking to your healthcare provider or pharmacist. Some medications, even over-the-counter medications you take for a cold or upset stomach, can change how your anticoagulant is working. This includes vitamins C, K, A and E, over-the-counter cold medications and aspirin, ibuprofen, and acetaminophen. Women who are or may become pregnant should discuss anticoagulant therapy with their healthcare provider before starting it. Talk to all of your healthcare providers, including your dentist, before you have an appointment and tell them you are taking an anticoagulant medication. If they tell you to stop taking your anticoagulant medication for a few days before these appointments, make sure to confirm this plan with the healthcare provider in charge of your therapy. And finally, if you become sick and have vomiting, diarrhea, or you are not able to eat, contact your healthcare provider. It's important to take your anticoagulant medication exactly as prescribed to ensure it does its job safely. If you have any questions about taking your anticoagulant, talk to your healthcare provider.